With a focus on reducing plastic waste, promoting reusables and making the most of waste recycling opportunities, we supplied posters for noticeboards outlining changes that could be made in the workplace and postcards for staff to take home, reminding them of some of the simple things they could do to reduce plastic waste. We also supplied a pdf guide on running a successful waste awareness campaign. The guide included activities to incorporate into the event, and ideas about engaging staff to take meaningful and positive action. Also included were an infographic and images to share via the intranet / social media channels so that both printed and digital bases were covered in order to increase reach. Introduction of charges for take away boxes to discourage colleagues using them. Removal of take away boxes from the counter, so staff have to make individual requests for them. Removal of polystyrene in catering supplies with the introduction of paper boxes instead. Coffee cup recycling facilities have been introduced for staff. 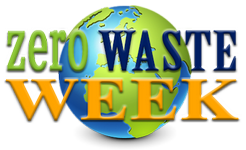 Energy & Environment Officer, Mohammad Rafique said “Zero Waste week’s material was really helpful to organise our waste awareness event. Are you holding a waste awareness event for your staff? Find out more about how we help businesses like yours, check out our range of display materials or contact us to discuss your requirements.